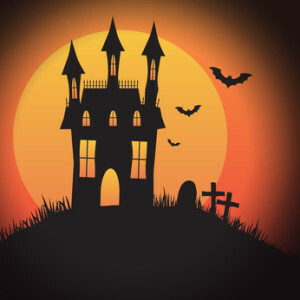 Find the best 2018 Halloween haunted houses in Virginia at Funtober’s directory of haunted houses. Funtober has a complete list of popular local haunted attractions including haunted corn mazes, haunted trails, haunted houses, scream parks, and other Halloween entertainment fun. Expect to find more ghosts, vampires, zombies, monsters, and clowns roaming the Virginia landscape at our haunt list. Most have Hollywood type set design, air blasters, creepy costumes, professional makeup, and all the sights and sounds to terrify grownups. When these ghosts decide to haunt a new house, they even pack the kitchen sink. So you know they will be ready to frighten you half to death at these Virginia haunted houses in 2018. We have separate attraction links and listings for haunted houses USA, haunted corn mazes, haunted trails, haunted zombie paintball, haunted forests, haunted hayrides, and ghost tours. Sorry folks this attraction will not open in 2018. Opening night is September 28th this year. Both attractions Darkwood Manor and Dr. Brain’s 3D Mind Maze are open every Friday, Saturday, and Sunday nights in October plus Halloween. Doors open at 7 PM. Tickets are $15 for Darkwood Manor or both haunts for $20. We combined detailed sets, movie quality make-up, and talented actors to create a scary and unique haunted house experience. Each year we tell a new story surrounding the legend of DarkWood Manor, with new characters and scenes. Lots of fun beginning opening night on September 21st. Enjoy the Darkside Hayride and the Firegrounds for just $15. More ticket options and entertainment available. Additional attractions are the Cornightmare and Forest. They are open every Friday and Saturday nights from late September through Halloween. Haunted Hollow has their season opening on September 28th. They run Friday and Saturday evening through Halloween. Hours open are dusk until 10 PM. Tickets are $18. The attraction centers around a haunted farm and haunted trails. This haunted trail in and around the barns of an abandoned haunted farm will leave you breathless or gasping for your last breath…come if you dare! Enjoy the Haunted Hayride, Field of Screams, and The Village of the Dead at the popular Hunt Club Farm. Open Friday, Saturday, and Sunday nights beginning September 28th plus more dates closer to Halloween. Check their webpage for schedule and prices. Haunted Hunt Club Farm celebrates 30 years of HAUNTING Coastal Virginia! The festival features three main attractions – the Haunted Hayride, Village of the Dead and Field of Screams for this year’s scare-fest! This Festival of Fear includes Carnival Rides, Concessions & Nightly Entertainment. The festival’s most-screamed about attraction, the Haunted Hayride, will take you on a voyage on a slow-moving, spine-tingling tractor pulled Hayride through the dark woods of Haunted Hunt Club Farm. Unprotected from the elements and all the things that go “bump” in the night, daring riders will experience theatrical displays by dozens of freakish inhabitants that lurk in the woods and along the narrow, winding path and an old decrepit old barn. An intense haunted attraction that takes about 10 minutes to go through. Tickets are $11. Open Friday at 6 PM and Saturday and Sunday at 2 PM. Located on Atlantic Avenue at the popular Virginia Beach tourist area. Lots of frights. Expect intense scary scenes. Sorry folks Route 29 will not open in 2018. Scaremare opens their season on October 11th. They run every Thursday, Friday, and Saturday nights until Halloween. Doors open at 7:30 PM. They close at 11 PM. Tickets are $10. It is about a 40 minute walk along a haunted trail, through the creepy woods and then into the haunted house. Open Friday and Saturday nights starting October 5th plus more October nights closer to Halloween. Haunt features a haunted trail and 2 haunted houses. Tickets are $24. You are dropped off and must find your way back. The creatures of the night are real. Attractions are named Scream Forest, Axl’s Fun House, and Staples Mill. Scream Forest is an intense walking adventure. We take you out to the edge of the woods…leave you…on foot with nothing between you and the creatures of the night…where no one cares if you Scream! Deep within Scream Forest you’ll discover Staple’s Mill, experience first hand the horrors and fear created by the strange experiments within it’s walls. Escape from the forest and you’ll find yourself entering Axl’s Fun House, a swirling maze of clowns, mysterious oddities and nightmares. The fun begins with opening night on October 5th. Open every Friday, Saturday, and Sunday nights in October. Hours are from 7 PM until 10 PM. Tickets are $35 online. Paxton Manor is Northern Virginia’s only REAL Haunted House for Halloween entertainment in Leesburg, Virginia and the DC area. Brand NEW this year the first 3 levels of the haunted manor has turned into Paxton Hall, a horrifying and haunted boarding school. Encounter new characters, including rebellious students and frightening teachers, as you unravel the dark and mysterious past of Paxton Hall. The haunt also includes Carnival of Souls, the basement of Paxton Manor, an attraction full of creepy clowns and carnival carnage. Our haunted attractions are not for the faint of heart. Located in the Military Crossing Shopping Center this haunt has run for over 24 years. It is a charity haunt supporting the March of Dimes. Plenty of scary fun for all. Generally open most Friday, Saturday, and Sunday nights in October. See web page for additional nights around Halloween. Opening night this year is September 28th. Open Friday and Saturday nights in October. You ride the haunted hayride and then are dropped in the woods and walk the trail nearly one mile back through a series of mazes, ghouls, and scary creatures. The fun starts at dark and runs every Friday and Saturday night in October. Tickets are $20. Deep in the woods of Spotsylvania County (Partlow, VA) the hills come alive in October. We take you on a LONGER haywagon, and drop you off in the woods. You will fear your journey through nearly a mile of live ghouls, zombies, clowns, mazes, and various other scares. There’s a lot of great houses in Virginia. But there’s also a number across the border in these states which might prove worthy of a visit. Have you visited one of these haunted houses? I would be interested in hearing what you thought. Did you have a good time? Was it worth the price? Would you recommend it to our readers? Any suggestions to maximize the experience? I’ll gladly publish what you send me and give you a great big hug. I would like to see if you could put are haunted house on your web site . We are a Volunteer Fire Dept that is putting on a show. Are group has over 30 years of experiance and is a must see!